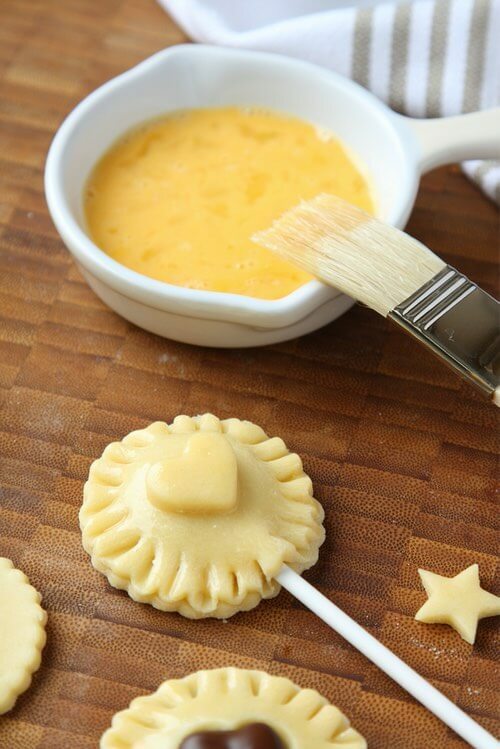 Today's Pie Pops on a stick are quite similar to the little pie patties that Mom made back in the 1950s, except she didn't bake them on a lollipop stick. These dessert treats are so easy to make, and you will love serving them to loved ones and watching their surprise. 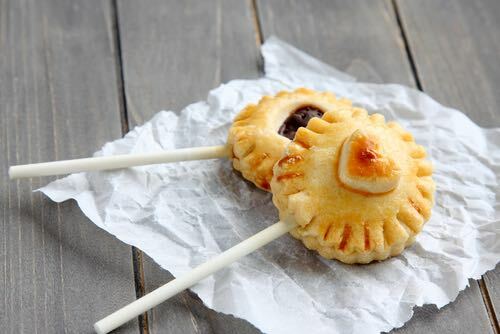 These mini pies on a stick are fun to make and absolutely delicious to eat. 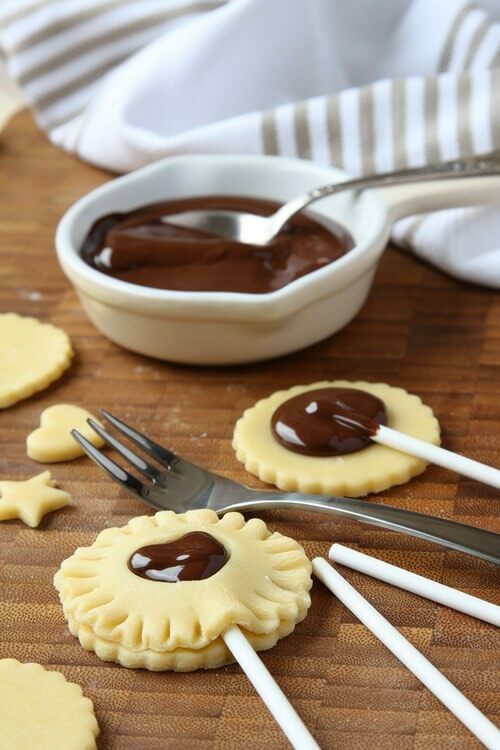 The lollipop stick is an optional novelty, as these mini pies will make an attractive addition to any dessert tray when served on their own. 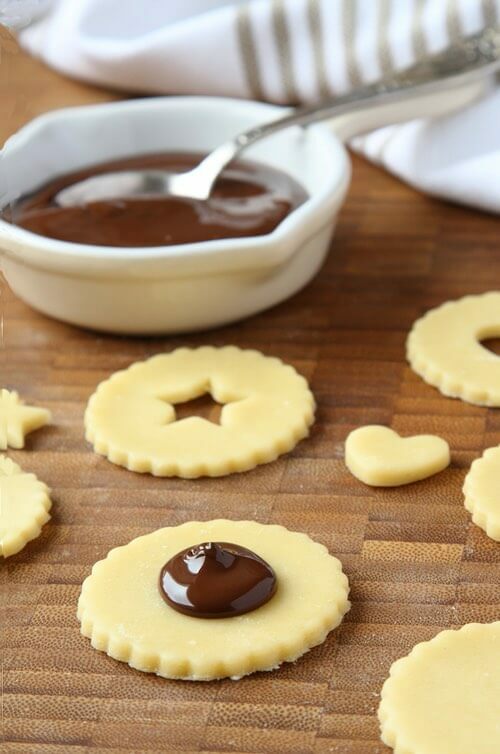 You can easily fill them with your favorite pie filling, thick fruit jam, peanut butter, cream cheese, pudding, bits of fresh fruit, or even Nutella®. Ask for your family's flavor suggestions and make a variety of flavored pops. Use your favorite pie crust recipe to make enough dough for a pie. Evenly roll out the dough on a floured surface until it's about 1/8-inch to 1/4-inch thick. Ready-made pie dough can be used in a pinch, but homemade pastry always tastes more flavorful, and it's not that difficult to make. 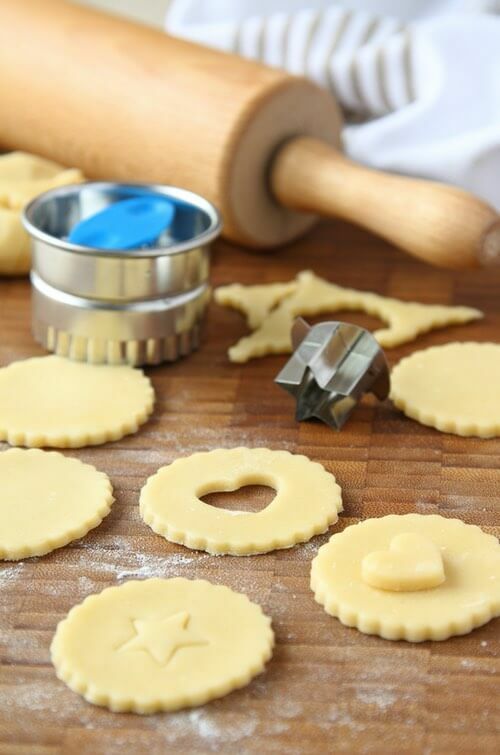 Choose a cookie cutter with a diameter of around 2-1/2 inches and cut out the shapes for your pops. Rounds, stars, and heart shapes tend to work the best, as they offer you more room in the center for the filling. You should be able to cut at least 16 shapes from the dough for a 9-inch pie crust, enough to make 8 treats. Lay half the shapes on a floured cookie sheet while reserving the remaining shapes for use as tops later. A baking sheet lined with parchment paper also works well. Carefully place 1 heaping tablespoon of pie filling in the center of the shapes (see photo above), making sure that your filling does not spread to the edges. You need to leave a small border about 1/4 inch from the edges of the shapes, so you can seal the edges when the tops are applied. Lay a lollipop stick on each of the shapes with one end of the stick in the center, and gently press it into the filling and the dough without pushing it through to the other side (see photo above). Popsicle® sticks can also be used, but white lollipop sticks tend to lend a more elegant appearance. You can find sticks at most places where cake supplies are sold. Beat an egg with a teaspoon of water and using a pastry brush or your finger, brush some of the egg along the border of the shape to help create a seal for the top. Next, take the top shapes and fit them over the filling while gently pressing the edges together using your fingers. Use a fork to crimp the edges and make sure the edges are completely sealed. Brush the tops with a little beaten egg and lightly sprinkle with granulated sugar. Place them in an oven preheated to 350°F and bake for about 25 minutes or so, until the tops are crispy and golden brown in color. Allow to cool before serving. 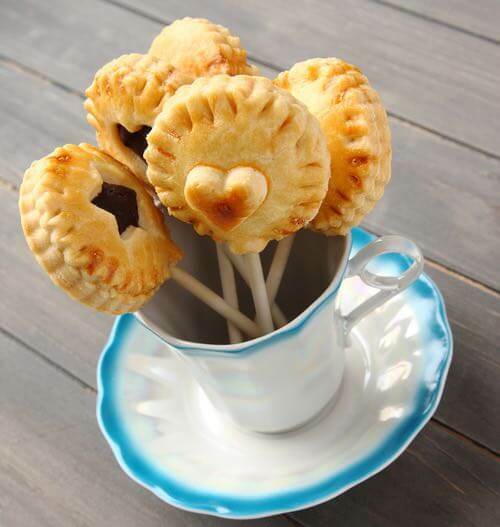 For serving suggestions, place your homemade pie pops in an attractive flower vase, fancy glass, or teacup, or insert them like a bouquet of flowers to decorate a special dessert cake or pie. Enjoy.